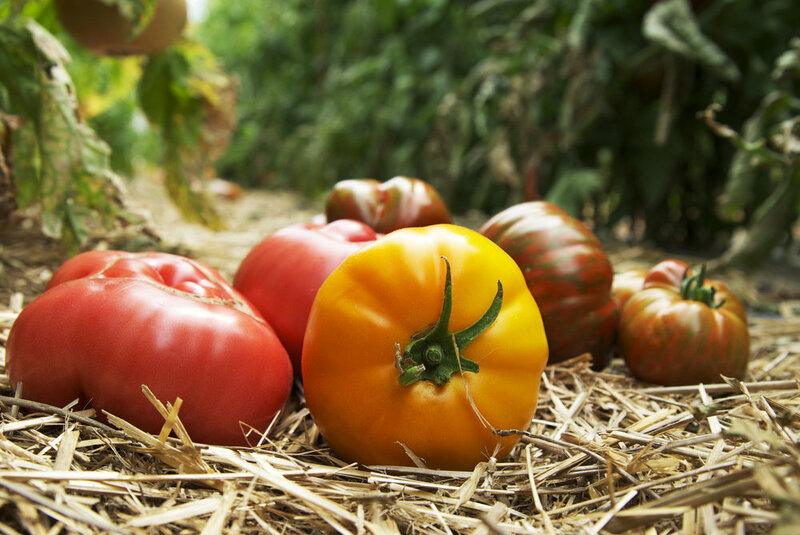 Heirloom tomatoes are making their first appearance of the summer this week at Native hill farm! Hope you are finding a way to stay cool with all this heat that has settle upon the Nation. Often times when we get some of these scorchers, we try to get to the farm extra early so that we can be done before the heat really sets in...but it is harder when we have prolonged heat as we just have too much stuff to do to knock off early every day. That said, our main reprieve has been swimming in the river. Maybe wallowing is a more accurate verb as the river is still moving rather swiftly, delivering cold mountain water to the farmers and reservoirs of Norther Colorado. Our irrigators have been working hard to keep the plants feeling cooler by overhead watering the head lettuce and putting shade cloth on our tunnels. The only real good thing about the heat is that is helping to ripen tomatoes! They have started trickling in and should just keep ramping up from here on out! We are moving into mid-summer and we will start to see a smattering of new crops appearing at market. This week we are harvesting walla walla sweet onions and we should have them for the next month or more. I like to use them in just about everything, but they really shine when grilled, or caramelized for pizza. They make a great addition to a raw cucumber salad but can also be used in simple pastas. Also this week, we are having an oversized zucchini sale. We try hard not to have extra large zucchini, but every once in a while they escape our diligent harvesting. I always think oversized zucchini are good for baking and I will often grade them down, squeeze the moisture out of them and then freeze it for colder times; however, I have one couple that loves the big guys just cut in half and slow cooked on the grill. They make good zucchini boats for stuffing with bred crumbs, cheese, and herbs. Look for them special at the market on Saturday. Beans are just starting to trickle in. Our first rotation was creamed several times by the hail and I am not expecting huge harvests from them. I briefly considering cutting them into tiny equal parts so that we would have enough for everyone, but that was a short lived idea. Instead, we will just rotate them between the market and the farm stand for a few weeks until our other plantings come one. We will also have a small showing of purple peppers, sungold cherry tomatoes, and heirloom tomatoes starting this weekend. The sun golds are basically candy disguised as a tomato, your kids won't even be able to tell the difference. The heirloom tomatoes are great for everything, but my tradition for the first ones is a big old BLT. I slather mine with hot pepper mustard and balsamic reduction, but you can be the judge about how fancy you want to be. If you miss out on the tomatoes this week, don't fear, there are oodles to come!